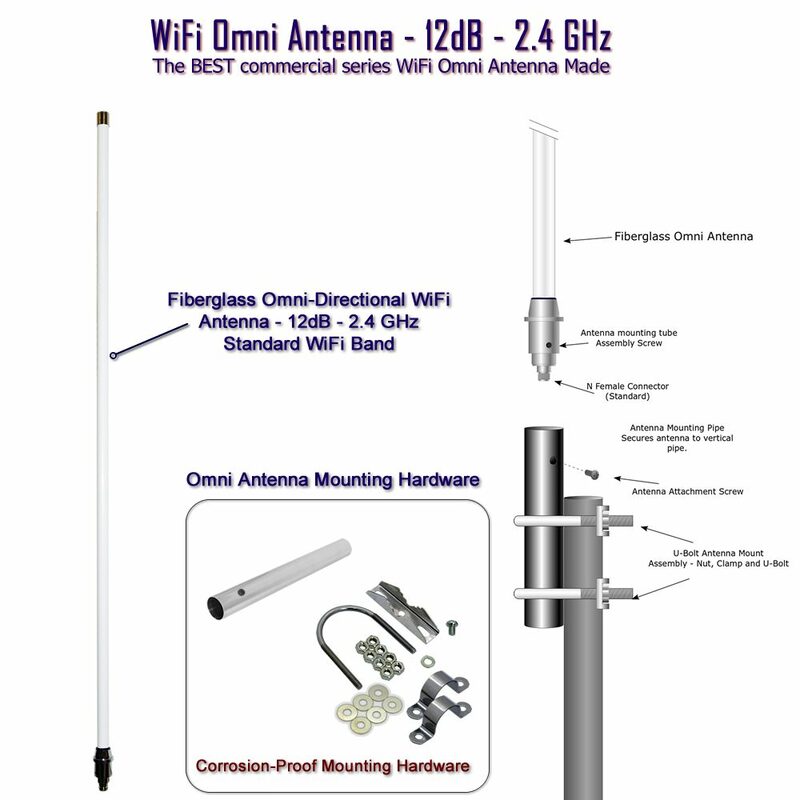 If you have an outdoor access point and need a tremendous boost to your outdoor wireless system, or just want the best 12 dB omni-directional wifi antenna, our commercial series omni is for you! The 12 dB WiFi Omni Antenna is sleek and effective addition to your wireless network. This antenna is very popular with wireless installers, setting up outdoor commercial networks to extend the range of access points, bridges and routers. are using the RadioLabs 12dB commercial omni antenna at home to extend the range of their wireless network to reach a great distance from their home. If you try one of these on your average consumer wireless router or access point, you will finally realize the potential of wireless communications. This Antenna, pairs perfect to all outdoor WiFi access points, such as RadioLabs o2Surf, or, to the Bullet, outdoor high power Access point. RadioLabs manufactures and offers numerous wifi access points for indoor and outdoor use. This 12dB omni, is the highest quality antenna offered, and is a commercial series, outdoor, fully waterproof thinwall fiberglass, multi-stacked dipole antenna, with excellent signal quality, excellent range, and no other antenna we offer has such high quality specs. RadioLabs has tested this antenna for over a decade in an outdoor coastal environment, and no hardware rusted. There was some corrosion on the threads of the U-Bolt, but easily came off with Steel wool. The aluminum mounting tube, is made out of high quality anodized metal, and is built overkill for its intended purpose. When we opened our shop downtown back in 2002, RadioLabs originally bridged our shop, to our secondary location here in our small town. This was before the wifi band was cluttered with hundreds of access points and home routers. Two of these antennas provided a dedicated wireless bridge system for years. Wifi has become so popular now, RadioLabs could no longer use omni-directional antennas for point to point wireless bridging, inside of our town, so we were eventually forced to go with a dedicated wireless bridge system. How Far will WiFi Antennas go? To really maximize your wireless bandwidth an antenna is vital, and this antenna is one of our most effective for extending your signal in all directions. You can easily set this antenna up and create a multi-point wireless network, or to distribute your high speed throughout your neighborhood. The High Gain 12 dB Wireless Network Antenna is constructed from sturdy, tight-weave fiberglass and enamel coated. If mounted properly on a sturdy mast or tower, the 12dB commercial omni can withstand extreme wind speeds in excess of 130 ++ MPH. By simply looking at this antenna, you will realize that this is the finest quality 802.11 omni antenna on the market. The mounting bracket is constructed from machined aluminum and the “U” clamp are corrosion-free stainless steel. Mounting Tube, aluminum brackets and U-Clamps included! 1.7 pounds with mounting hardware. The NEW CaptiFi Ultra, Ethernet WiFi antenna not only has the high power and long range our customers have learned to enjoy from all RadioLabs antennas, but is now 10x faster, easier to use, and no software to install on any device, ever. Our CaptiFi Ultra, is a fully weatherproof high power design, with integrated Ethernet design, allowing for the maximum throughput of 150 MBPS, simple Power Over Ethernet and full 12 VDC or 110 VAC compatibility. Outdoor WiFi Access Point – 12dB Omni kit – Creating a high power outdoor Access Point can be a difficult task. You select the components you think will create a stable, high speed WiFi Access Point, join it to your network, and find out you have inadequate coverage, or don’t have the WiFi Speed, or WiFi devices can’t reach the outdoor WiFi access point. 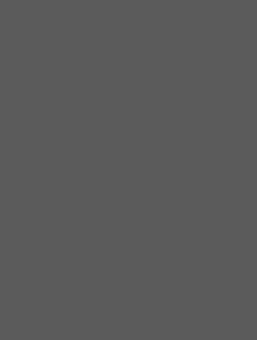 Creating a stable Wireless AP is a difficult task. Performance will vary radically depending on components you choose. Or, you create a high power access point, only to find out that the receiver on the device you selected is not sensitive enough to receive weak signals from low power devices. Well, with over 1-1/2 decades of WiFi experience with every wifi product known to man, RadioLabs is proud to release the only WiFi Access point you ever need for RV Parks, Marinas, Farms, ranches, large properties with acreage. Every single device is selected for a specific purpose and we present the best performance complete package for our customers. The RadioLabs o2Surf Outdoor Access Point System. The only public or private access point you need. 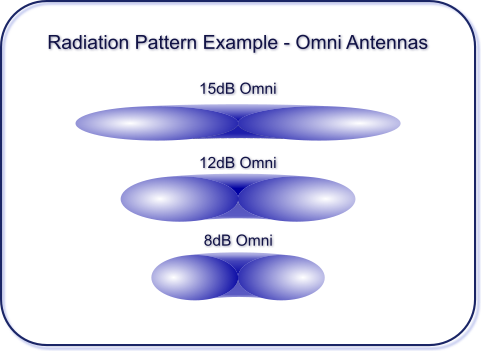 The 8 dB omni-directional wifi antenna is the best quality commercial series wifi / wireless antenna from RadioLabs. Fiberglass construction, and commercial series mounting hardware, this 8dB omni antenna from RadioLabs, covers the entire 2.4 GHz wifi band, has excellent vertical radiation pattern with the best coverage under the antenna, or under the antenna for wifi coverage where you need it. This antenna comes with our aluminum tube and full mounting hardware. No other antenna on the market offers this quality, gain or reliable signal coverage.